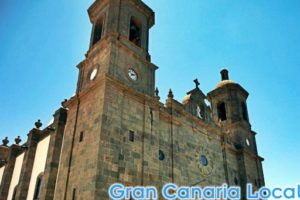 0.1 Does working on Gran Canaria appeal? Traditionally, foreigners came to GC to work in bars and teach. But with the digital nomad revolution, times are a-changing. 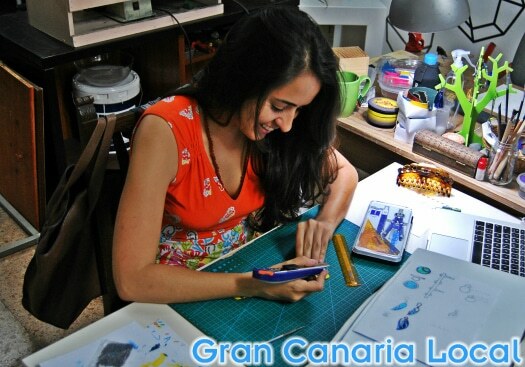 Does working on Gran Canaria appeal? Traditionally, foreigners came to GC to work in bars and teach. But with the digital nomad revolution, times are a-changing. 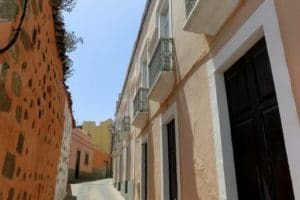 When we relocated to Las Palmas de Gran Canaria in 2004, the expats we met in the capital tended to be those who worked in the island’s schools. 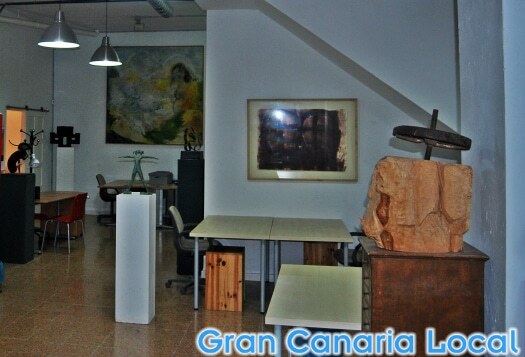 But then the likes of CoWorking Canarias and The House sprang up. Recently we paid a visit to another coworking space in the city, Soppa de Azul. 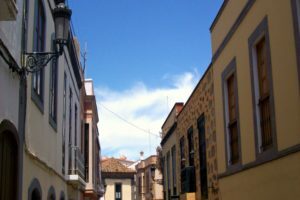 If Gran Canaria resembles Greater London in shape and size, Las Palmas de Gran Canaria feels like a royal borough. It’s therefore pretty easy to negotiate. 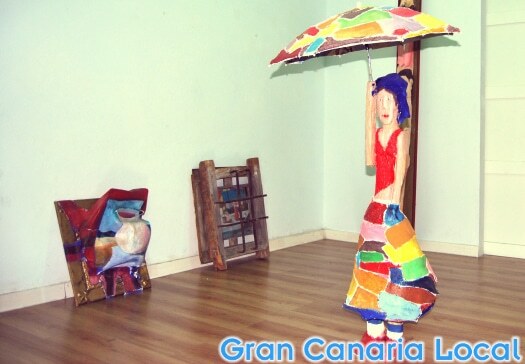 You’d have a hard job getting lost in the Gran Canaria capital. But if there’s one neighbourhood which will confound you, it’s the warren-like La Isleta which is where you’ll find Soppa de Azul. 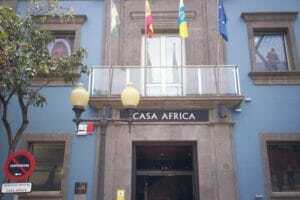 Luckily for you, it’s located on Américo Vespucci which leads down to the La Puntilla section of Las Canteras beach. 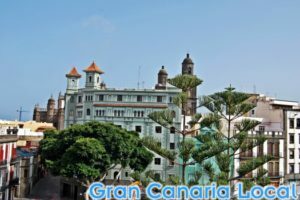 If travelling from Parque San Telmo, the main bus station in Las Palmas de Gran Canaria, get off the 1, 12, 17 etc at the Mercado del Puerto stop and you’re literally just around the corner from your destination. Upstairs at Soppa de Azul is accessed at street level. After entering, you can expect a warm greeting from owner Alecs Navio. 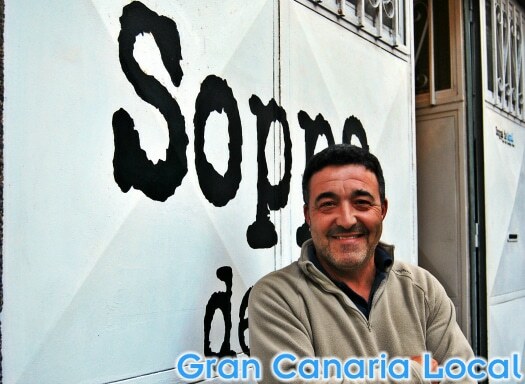 Previously the creative genius behind Ibiza gallery Bullit de Blau (Catalan for Cooked Blue), he opened the similarly-titled Soppa de Azul in September 2012. It’s upstairs which hosts the coworking space. Here, for €100 a month, you get a fixed landline to receive calls, a chair and desk available to use Monday to Friday from 9:00am to 8:00pm, and a free meeting room which you can book for up to three hours a week. 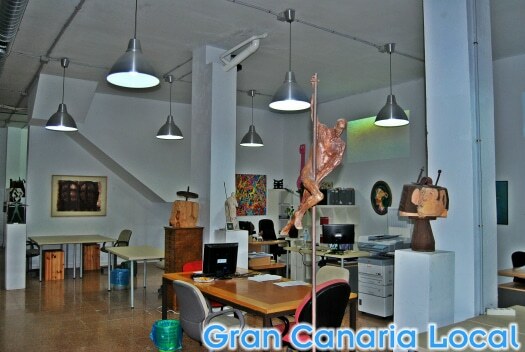 Coworkers also receive 30% discount on courses/workshops offered by Soppa de Azul and 50% on rental of space for exhibitions and events. When GCL popped by, Alecs Navio, an artist himself, was preparing to put on his latest show in the room which doubles as a gallery. There are regular concerts and life-drawing classes as well. Navio, Madrid born and bred, started his working life by running a marketing firm in the Spanish capital. And he’s harnessed this business mind to oversee exciting new projects such as Linkispot. This application, currently in Beta version, will help to bridge the gap between the needs of a guest and the services a hotel provides. Workspace up top, Soppa de Azul’s more workshop down below. Here, artists and artisans operate side by side. Like in the case of Beatriz Artiles Jewellery and Paola Duque Jewelry. Then there’s the studio of photographer Alby Martin. It’s his quasi-Victorian images which adorn the interior of one of our Facebook page’s most recent Businesses of the Week, TESLA Steampunk Bar Café. Martin teaches his talent to others, by running courses. Soppa del Azul, seat(s) of learning and all that.